Emmy Award winning Celebrity Films presents “Car Men” which details the touching and occasionally hilarious story of how the Myers men created a car business that’s known all across America for its successful out-of-the-box thinking – not to mention its off-kilter TV commercials, featuring such quirky characters as Uncle Frank and Chainsaw Charlie. 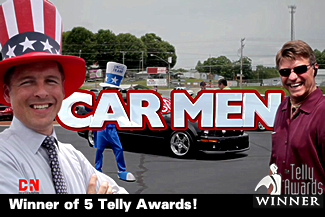 As one auto pro says, “In the car business, Tracy Myers is who everybody wants to be.” Watch the 5 time Telly Award winning film “Car Men” and you’ll find out why. BONUS: Get additional footage not seen in theaters and also get a digital copy of “Uncle Frank ‘Sez’!